Durham, N.C. — In a March 2019 amicus brief filed in the U.S. Supreme Court case Rucho v. Common Cause, voting advocacy groups Democracy North Carolina and You Can Vote detailed harms to voters wrought by partisan gerrymandering in North Carolina. The “friend of the court” brief documents both organizations’ interactions with voters and potential North Carolina voters in all corners of the state, who have expressed a belief that the outcome of the congressional elections in their districts are “predetermined” because the district lines have been drawn to favor one party or the other, especially among youth and minorities communities. Democracy North Carolina Southeastern Regional Managing Organizer Val Applewhite echoed Fellman’s sentiments, reporting that citizens have a “loss of faith in government” as a result of the legislature’s repeated efforts to dilute their votes. The brief also highlights how a perception among North Carolinians that their votes have no impact correspond with statistical evidence showing that partisan gerrymandering has had the effect of dividing communities of interest and minimizing the overall impact of North Carolinians’ votes. 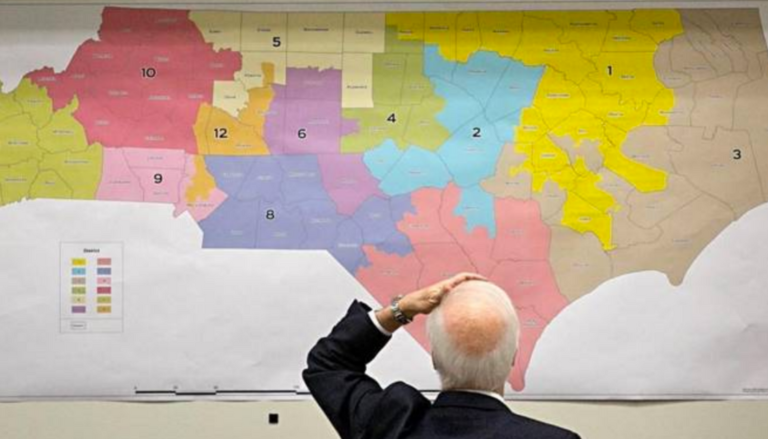 If allowed to stand, the also brief argues, the legislature’s “deliberate dilution of North Carolinians’ votes is highly likely to persist into the future” and politicians drawn into “safe” districts are and will remain unresponsive to voter concerns. The U.S. Supreme Court will hear oral arguments in Rucho v. Common Cause on March 26, 2019. Voting rights groups show how partisan gerrymandering hurts voters' trust and impact. Along with other coalition partners, Democracy NC and You Can Vote have organized public education efforts around this opposition to partisan gerrymandering. Both organizations participated in the 2017 Fair Maps campaign which had the goal of mobilizing support for a process for drawing district maps that is fair, open to the public, and nonpartisan. As part of the Fair Maps campaign, hundreds of Amici’s volunteers participated in phone banks, went door-to-door, and set up booths at community events. Over a nine-month period in 2017, Democracy NC collected nearly 23,000 petition signatures in support of nonpartisan districting. The majority of the signatures came from North Carolinians with no previous connection to Democracy NC, but who were nonetheless motivated to take action because of the harms caused by partisan gerrymandering. Democracy NC also collected nearly 2,500 postcards addressed to individual North Carolina representatives calling on them to support an independent, nonpartisan districting process. Still more postcards were mailed directly by citizens to their representatives. Other citizens contacted their representatives by phone and email to urge their support for nonpartisan districting and expressed their opposition to partisan gerrymandering in-person to their representatives. On March 1, 2017, Democracy NC co-hosted the “Citizens Lobby Day to End Gerrymandering” at the North Carolina Legislative Building in Raleigh. Nearly 400 citizens attended, coming from across the State. Through this work, Democracy NC and You Can Vote found overwhelming popular opposition to partisan gerrymandering. For instance, of the 1,290 people who You Can Vote volunteers spoke to during their door-to-door efforts, 1,239–i.e., 96%–completed a postcard to their representative in support of nonpartisan districting. North Carolinians support political districts that are not drawn to diminish the power of their votes. For more information about the movement for fair maps in North Carolina, visit demnc.co/fairmaps.